Separate your audio from an HDMI source and listen to it on high-end speakers with this UHD 4K HDMI 2.0 Audio Extractor from A-Neuvideo. 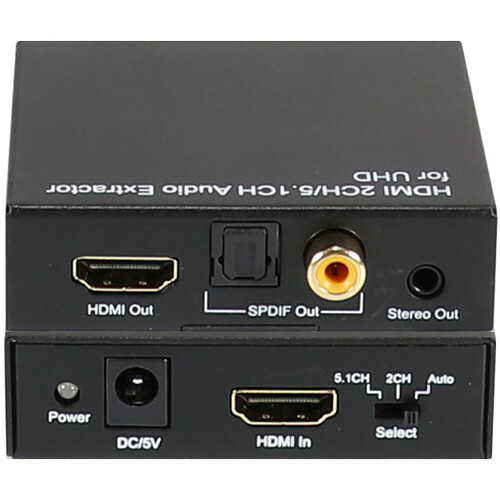 This extractor connects an HDMI video source to an HDMI TV and to a separate audio system over a TOSLINK, RCA, or stereo audio port. Multichannel audio is extracted and sent to your sound system in a variety of formats such as 5.1/7.1, MAT/MLP, Dolby Digital, Dolby TrueHD, Dolby Digital Plus, DTS, DTS-ES 6CH, DTS-HD, DTS-HD-HRA, and DTS-HD Master, and it also supports LPCM uncompressed audio. Supported video resolutions include 12-bit 4K at 60 Hz, 1-bit 1080p at 60 Hz, or 12-bit 720p/1080i at 60 Hz. A manual selection toggle allows you to switch between 5.1, 2-channel stereo, and auto-select audio output. If you plug a stereo-only device such as headphones into the stereo jack, the output will automatically switch to stereo. The original audio will also remain embedded with your HDMI pass-through video. An AC adapter is included with the unit. Box Dimensions (LxWxH) 7.0 x 5.0 x 2.5"
UHD 4K HDMI 2.0 Audio Extractor is rated 1.0 out of 5 by 3. Rated 1 out of 5 by John C from Did not work at all Can only review something that actually works. Unfortunately, this device did NOTHING from the moment we opened the box. No matter what setting, what input, what resolution, there was NO audio output from this unit. Even more disconcerting, B&H has not responded to any of my notes or comments on it. Rated 1 out of 5 by John C from VERY DISAPPOINTED This unit did NOT work at all. Would not output any audio, and video connection was very poor. Did better by just taking audio directly our of projector and into sound board. Rated 1 out of 5 by John from Didnt Work This may work on a DVD player but it doesnt work with the HDMI port on a laptop. When switched to 5.1ch with the digital coaxial/optical connected, will the original audio still remain embedded with the HDMI pass-through video? Or does the original audio only remain embedded in the HDMI output when switched to 2ch with a stereo only device connected? According to A-Neuvideo the audio always remains embedded with this product.